The first thing that strikes you about this camera is the build quality. It has a metal body and feels good and solid, and thanks to its roughened finish and rubberised handgrip it is very easy to handle. It is slightly heavier than some cameras, due in part to the 4 AA cells it runs on. The next most noticable feature is the number of buttons and settings on the mode dial. This is a bit of a give-away as to the sophistication of this camera. Although you could live with the camera in full-auto mode, it would be an absolute waste of its more professional features. These include both aperture- and shutter-priority, full manual, a wide range of scene modes, auto- bracketing, macro (20cm) and super-macro (3cm) modes. Most features can be accessed without resorting to the menu system and instead use a jog-wheel to cycle through a set of options. For example to select macro mode, you press and hold the focus (AF/Macro/MF) button and use the jog-wheel to select Macro from a set of possibilities. Whilst this takes a little getting used to, it is far quicker than navigating six levels of menu as you might on some other cameras. 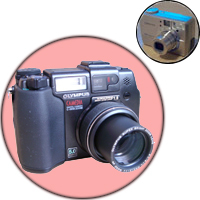 The camera has both a TFT display and and LCD panel. The TFT screen is nice and bright and is easy to read even in bright sunlight. It also tilts up through 90 degrees, allowing the camera to be used at waist level, and down through about 30 so you can take shots above your head. The LCD panel conveys a lot of information about the current settings, from flash settings to F- stops and shutter speed. This really helps to minimise the usage of the colour display, and dramatically prolongs battery life. I have taken over 200 pictures on one set of batteries! Picture quality is superb. There is a slight tendancy to under-expose, particularly on whites, but this is preferable to over-exposure, which is much harder to correct afterwards. You do need to be careful when photographing highly saturated colours, like close-ups of flowers in strong daylight, as the colour can get burnt-out, producing patches of saturated colour and losing any detail. This seems to be particularly apparent with reds and magentas. Apart from that the focussing is spot on and the detail is almost unbelievable, particularly in super-macro mode. Shutter-lag is not really a problem, but the focussing takes noticably longer when using either macro or zoom. As with most auto-focus cameras, to make sure you get what you expect simply depress the shutter half-way to get the camera to focus and then press all the way to take the picture. One unusual feature is the presence of not one, but two flash card slots. The larger takes CompactFlash (both type I and II) and MicroDrives, the other takes either SmartMedia or xD cards. The camera is supplied with one 32MB xD card, which does not really hold that many pictures - if you are going to use the highest quality setting you really need a 128MB card as pictures average around 2.5 to 3MB a piece (interestingly the camera estimates them at about 4MB so the shots remaining count is not a very good guide). The camera can take two cards at once (one in each slot) and there is a button to switch between the two. Another interesting feature is panorama mode. Unlike some cameras, this does not display part of the last frame for you to line up the next, instead it just seems to mark the image as part of a panorama and the order in which the pictures should be stitched together. Oddly for such a simple feature it only works with Olympus brand flash cards. The speed at which images are processed and written to flash is quite impressive, even using ordinary CompactFlash (as opposed to Ultra fast). This makes the camera much more usable, particularly for taking pictures of people. There is very little to fault with this camera, but one really horrible feature is the factory settings - the default is to reset everything when the camera is turned off! This means that the picture quality reverts to the lower setting and the selected card reverts to xD as well. This can be easily corrected, but is very frustrating when you want to take high-res pictures onto a CompactFlash card! Another strange features is the picture numbering, which uses both folder and file numbering along with the date - this makes it quite difficult to keep your snaps in the order you took them without replicating this system on your hard disk. One of the biggest oversights with the camera is the lack of a printed copy of the reference manual. Instead you get a printed introduction to the camera with the reference manual residing on the accompanying CD-ROM. Whilst this is not a major obstacle, it does mean that you must first have access to a computer and that you must take the time to print out the sections you are likely to want to refer to. Whilst almost everything is catered for on the camera, there are a couple of optional extras which you may want to purchase. One is the Remote Control, which lets you operate the zoom and shutter via a tiny infra-red unit (North American users actually get this included). The other is the necessary adapter ring to allow standard filters and rings to be attached to the lens barrel of the camera. Whilst there are only a limited number of filters useful to digital users, things like a polarising filter produce effects which it is not possible to replicate in an image editor. I am extremely happy with my C5050-Z and would recommend it to any serious amateur who does not want to go the whole (and very expensive) hog to a digital SLR. This camera has many features found on SLRs, and picture quality which is on a par (apart from the really expensive cameras), the only difference is that it has a viewfinder instead of looking through the lens.